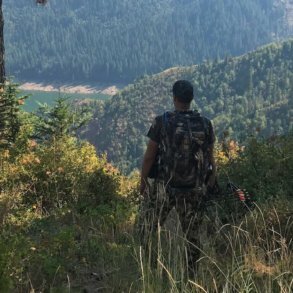 I started rattling for bucks a few years ago, and in the interest in sharing what has turned out to be the most adrenalized deer hunting tactic I’ve ever experienced, here’s what I’ve learned. 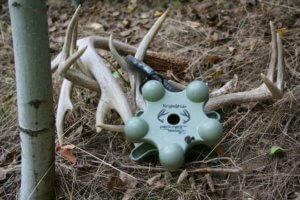 One of the most exciting ways to hunt whitetail deer is by rattling to call them in to you. Where you hunt and the weather will affect your results. I’m sure there are differences between how and when big whitetail bucks respond in Texas, Iowa, and Idaho. What I’ve found in Idaho is that the whitetails around my home tend to respond better early in the rut — it seems as if bucks are more likely to charge in to investigate while they’re amped up to get things started . . . and not after they’ve found a hot doe to follow around. For me, that’s been in the second and third week of November. Keep in mind, the “pre-rut” can start in November and the full-on rut with does in estrus and can run well past Thanksgiving. If early November is cold and overcast with less sunlight getting through, that’s my signal to head out a few days earlier to start rattling — which is what more experienced hunters around my hunting area do, too. If the days are warm and full of sunshine, it seems as if the pre-rut and rut run a few days later. If you see big bucks cruising across open fields with their nose to the dirt, you’re definitely in the rut. As for time of day, morning has been about three times as effective as afternoons or evenings — but I’ve heard stories of guys calling in big whitetail bucks near dark, too. One of the first nice bucks I rattled in with my son snuck in quietly, keeping a large mess of brush between us and him. We heard activity from another part of a wooded draw — which is where we expected a deer to come from — but nothing appeared. As for the sneaky five-point buck, we could hear some soft movements but not see anything. Finally, my son stood up and tried to get into a better position to investigate, which spooked the buck, which was less than 30 yards away. Lesson learned: If one of your lanes is obscured by heavy cover, reconsider your position. Even if you have a great shooting lane, if you’re looking into a likely draw and the wind is blowing your scent right down into where you think the bucks are, your odds of enticing a deer to charge up out of it shrink to near zero. If wind directions seem to swirl a lot, definitely invest in some buck urine or doe scent products, as well as a some scent eliminators (see below for the gear links). Plus, the pros say that some deer will circle around and only come in from downwind, so you might be able to distract the smart ones with buck urine or doe in estrus scents long enough to get a shot. It’s hard to say how well these scents really work because whitetail deer have such an astounding nose, but if you can get a deer to pause, just three seconds can make all the difference. If you’ve snuck into position, there might be a deer bedded down near you. If you start with a wild fight — especially during pre-rut — you might startle the deer into running off. 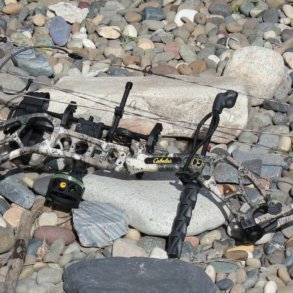 Even if you startle a doe, what self-respecting buck is going to watch a doe run right in front of him then pay attention to a fight somewhere else? So lightly rattle your antlers or rattling system for 30 seconds or so, then wait a minute. 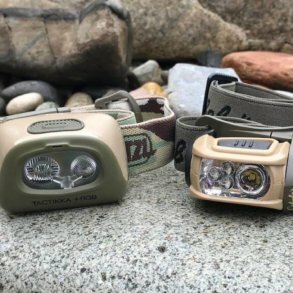 In addition, you could start out with a wheeze or buck grunt with a buck call like the Primos Buck Roar Call — but you don’t have to grunt to be effective rattling. The sounds of grunts and wheezes don’t travel as far as rattling anyway, so while I like to throw in a grunt every now and then, by the time you get to step four below, the value diminishes as you try to attract far-away bucks. The Knight & Hale Pack Rack Magnum Deer Call rattling system slips into your pack easily and delivers big sound when you need it. Check it out at Amazon.com. If your gentle wake up call for nearby bucks doesn’t yield any interest, you might as well go big or go home: crash your antlers together and grind them, trying to simulate the sound of two bucks locking horns and trying to push each other around. Stomp the dirt with the heel of your boot a few times, and keep the rattling going for about two minutes — with a few small pauses along the way to simulate bucks who break apart and eye each other before coming back for more. If you can, snap a branch or two or stomp on some small brush. The real challenge is creating fighting noise but not moving around so much that an approaching buck can spot your movement. In another instance, I posted my son up near the top of a meadow, while I moved down to the middle edge of the meadow to rattle. I rattled and recreated an epic fight, stomping the ground with the heel of a boot a couple of times and snapping a branch. Then I settled into position to wait. About five minutes later, I look up at a smudge coming at me from the other end of the meadow — about 800 yards off. I put my scope on it, and before it dips out of sight in a shallow part of the meadow, I get a glimpse of a big rack. 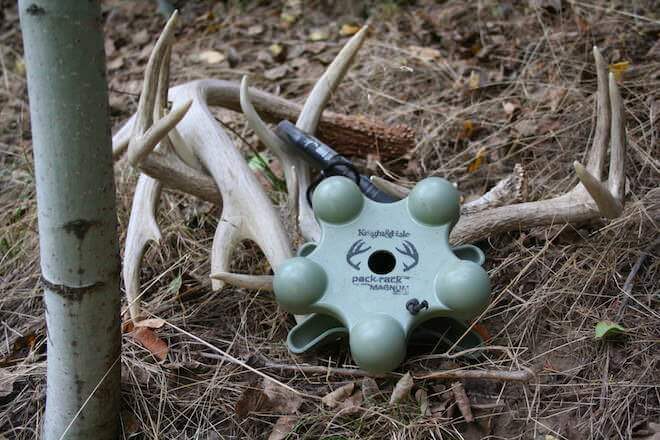 The Black Rack Deer Rattling Antlers system includes an instructional DVD. The buck then dropped out of sight into a long and shallow draw . . . and I started wondering: Surely my son has seen this buck, right? There’s no way he stopped paying attention. This buck has covered 400 yards across a mostly open meadow, moving at a good clip . . . broadside to my son. So where is the shot? It finally comes. Didn’t sound like a hit. Then another. I jump up to get a better angle, and the buck has veered off course, obviously looking a bit confused — and seeing a man appear 70 yards in front of him didn’t help. He stops and I throw my crosshairs on him, but I decide not to shoot the first big buck that my son missed. I can only imagine my son’s heart rate since he got to watch the buck cruise hundreds of yards before it got into a prime shooting location. Even if I had been sitting right next to him, I’m sure he would have had a tough shot working with the excitement. Like I said, that buck was coming in hot, and it was packing serious muscle. Had I been there, the only difference is that I would have reminded him to use his shooting sticks for a more stable rest. All I can say is this: You’ve got to try rattling in big bucks. Shop deer calls at Cabela’s — rattle horns, grunt tubes, and more. As it turns out, the packability and realistic sound produced by these systems work well. 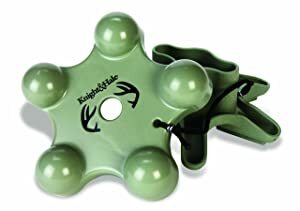 Personally, I like the Knight & Hale Pack Rack Magnum — it’s worked for me over multiple seasons — but I wouldn’t hesitate to rattle with any of these systems. 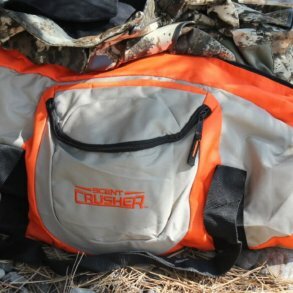 Choose whichever fits your hunting style best. 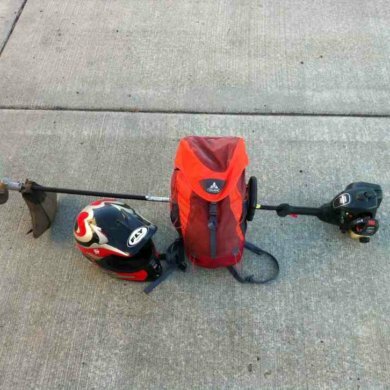 Knight & Hale Pack Rack Deer Call — Sound carries well, slips together for easy, silent packing. Also available in a Magnum size for even more volume. Black Rack Deer Rattling Antlers — Shaped similar to real antlers, but they are black so won’t be confused by other hunters. Comes with an instructional DVD. 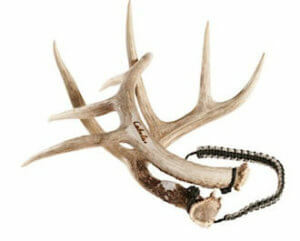 Primos Fighting Horns Call — Shaped like real antlers, a bit bulky. Primos Rack-N-Roll Fighting Bucks Deer Call — Can strap it to your leg for one-handed use, which is handy for bowhunters. Cabela’s Real Rack Rattling Antlers — Real sheds from Montana, Wyoming and New Mexico. Primos Hunting Control Freak Scent Eliminator Complete Kit — Deoderant/antipersirant, bar soap, laundry detergent, shampoo, 16-oz spray. Wildlife Research Scent Killer Gold Spray Combo Pack, 44-Ounce — Scent eliminator. Code Blue Code Red Buck-N-Does Combo Scent — Three scent kit. Tink’s Scent Bombs (3 Pack) — Comes with easy-to-hang strips. Buck Bomb Ambush — Aerosol spray disperses scent in a gas cloud that drifts downwind. Shop deer calls at Bass Pro Shops — rattle horns, grunt tubes, and more.